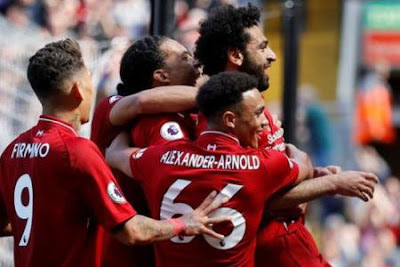 Liverpool secured fourth place in the Premier League with a thrilling 4-0 victory over Brighton at Anfield on the final day of the season. It was an impressive performance on a perfect sunny afternoon today at Anfield with the Champions League final against Real Madrid to come on 26 May. Salah fired the hosts in front during the first half at Anfield, the forward scoring his 32nd league goal and, in the process, set a new competition record for a 38-game season. Dejan Lovren doubled the lead by powerfully heading in Andrew Robertson’s cross and after the break it was more of the same – Liverpool continued to dominate. Brighton offered little by way of a response and Dominic Solanke’s stunning first goal for Liverpool and a debut strike from Andy Robertson added further gloss to the impressive performance. The victory meant the Reds matched their fourth-place finish of last season.